Oregon Changing Student Loan Repayment? Could the landscape of student loan repayment be changing? I have to admit, I don’t cover a whole lot of college topics here (because I’m a bit removed from that age group), so I almost missed this altogether. But, it kept coming through on feeds, and it finally piqued my interest enough to get me to take a look. I’m glad I did, because it’s actually gaining traction and could be something that becomes normal in the years to come. 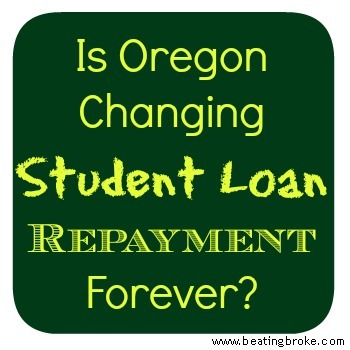 What is the Oregon Pay it Forward loan repayment plan? Pay it Forward seems to have had an interesting life cycle. It was originally devised by a class of college students, working with the Economic Opportunity Institute, and then presented to the state legislature. From there, it appears that the Working Families Party of Oregon, who happen to have been co-founded by the students’ teacher, took it under their wing and started pushing it. According to this article in the New York Times, the resulting bill passed the Oregon House and Senate earlier this month. From there, I would imagine that it’s got all kinds of structural work to be done in order to put the systems and processes in place to be fully functional. But, once that’s done, it should become available to students in a few select universities and colleges sometime around 2015. The plan, as it’s stated on the Working Families Party of Oregon website, will operate with a dedicated fund from which the tuition will be paid to the school. After the student graduates, and gets a job, the student will then pay a fixed % of their salary back into the fund for 20 years. The % that the graduate pays will depend on how much schooling they’ve received. Under the proposed system, you would pay .75% of your adjusted gross income (AGI) for each year of school, or 45 credits. This means a student who goes for a 2-year degree would pay 1.5% of their AGI per year, while a student seeking a 4-year degree would pay 3%. That should account, mostly, for the discrepancies of cost in tuition from a two-year degree vs. a full four-year degree. The website also states that should a graduate be unemployed, there would be no repayment necessary until the graduate attains a job. Is the Oregon Pay it Forward plan a good idea? In my opinion, it’s both good and bad. It all depends on how you look at it, really. If you’re like me, and intend to work in a profession that basically requires a degree of some sort to even get your foot in the door, it could be a really good deal. Heck, I’ve been out of college for 7 years. Almost half way to their repayment period. I’m not even close to half way to the end of my student loans, yet. So, in that way, the plan might be a good thing. 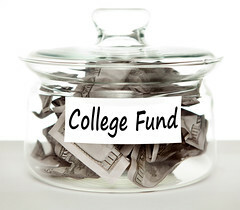 It lowers the financial barrier to higher education, and makes less of a burden of the repayment of any tuition bills. The lowering of barriers is also why I think it could end up being a bad thing. Part of the reason that I think the higher education system is under so much fire is because it’s already too easy to get a student loan and go to college. If anyone can do it, suddenly everyone must do it. If you want any sort of foothold in the professional community of your choice, you’ll need that degree. That causes problems. Demand for a college education never decreases. The law of supply and demand says that the supplier (colleges in this case) can charge whatever the market will bear based on the fluctuations of demand. If demand decreases, so too should supply. If you want demand to increase, you reduce the cost of whatever you’re selling until demand begins rising again. But, if demand never decreases, why should the cost of the education? The supply of college attending students increases, increasing the demand for classrooms to teach them in and professors to teach them with. School expenses increase due to the new buildings and additional staff. If the fund for the plan doesn’t keep up, the money has to come from somewhere else. Know where? The state. More specifically, the taxpayers of the state. It’s too early to pass judgement on whether the plan will work or not. Heck, the ink is barely dry on the bill itself. It’s still got all kinds of tape to work it’s way through before it can begin being used. I doubt that we’ll see any real results aside from an increased enrollment in the schools that pilot the program for at least 5-10 years. Remembering that repayment likely won’t start for 4 years from the first enrollment. I think it’s clear that the current state of student loans and their repayment needs to be reworked. It’s unclear, however, whether this plan is the right answer. It might be part of the answer though. Combine something like it with a more rigorous acceptance process, and you might have a winner. There’s little question that student loans can be one of the more difficult debt burdens that a person can have. The cost of tuition is rising each year, and the rates seem to be following suit. Many college graduates are finding themselves with a degree that cost as much as their first house is likely to. It goes to reason, then, that finding any means available to help pay that debt off is probably a good idea. I was recently introduced to a product offering called Smarterbank. It’s an online checking account that’s run by The Bancorp Bank. It’s fully FDIC insured to $250,000 and, for most purposes, operates just like any other online checking account. Much like some other online banks, Smarterbank has some perks attached to their accounts. 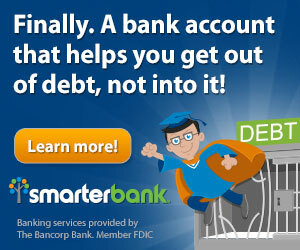 In the case of Smarterbank, they give a “cashback” that goes directly to your student loans. For purchases under $100, they apply .5% of the purchase to your Smarterbucks account. For purchases over $100, the first $100 gets you the same .5%, and everything over $100 gets you 1%. One of the nice perks of Smarterbank is that it’s a relatively fee free account. There’s a monthly “inactivity” fee if you don’t use the account at least once in a month of $4.50, otherwise, if you’re a smart user, you’ll never hit a fee. And, by smart user, I mean you don’t overdraft, or do something else silly. They’ve got fees that are associated with things like statement research, etc, but those are pretty standard and you’re pretty unlikely to ever use those services. You also get access to over 40,000 ATMs in the STAR ATM network. As I mentioned above, the “cashback” goes into your Smarterbucks account. So, you’re probably wondering what the heck that is. Smarterbucks is a rewards program. Not unlike programs like Swagbucks, it rewards you for certain actions. Things like shopping through their portal (“Smarterbucks Marketplace”) earn you cash back that is credited to your account. You can also ask others to contribute to your account. That option could be pretty cool to use as an alternative for people to give to you for birthdays, Christmas, or special events. Once your Smarterbucks account reaches $15, they send a payment for that amount to your student loan. At first, that might not seem like much, and, really, it isn’t. But, every little bit helps. And every $1 you pay off early is $1 that you aren’t accruing interest on for the life of the loan. And that can add up in a hurry. Would you switch to an account like Smarterbank for an offer like this? Is the offer strong enough to make it worth the time? What other offers have you seen that help with student loan payback? See all the details on Smarterbank.